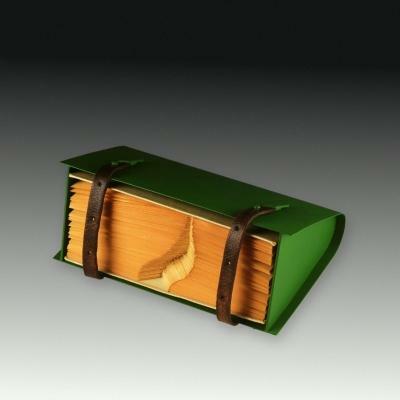 Technique: Folded book; the botanist's container consists of a greenish lacquered metal drum with two black leather straps as fastener. Description: Claudia Steiger inserted a book on botany in a green metal box. With two clasp of leather it can be opened. It's a kind of botanist's container serving botanists to collect plants outdoors. The notch conveys the content of the book.